The goal is to maximize the value of items placed in a knapsack. Each item has a value and a weight. The knapsack has a weight limit. The program uses Dynamic Programming and Branch and Bound to solve the problem. You can view the program solution. There are 100 games. Each game has 96 items. 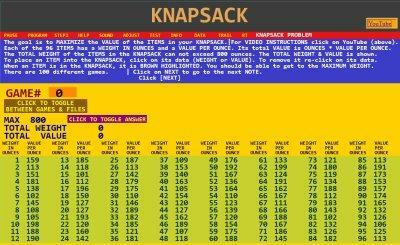 You can create your own knapsack game. Your game's data will be stored in the browser's local storage area. This game is written in a p-code. The p-code is executed by a p-code engine. If you click on PROGRAM in the RED STRIPE at the top, you can view the p-code programs. The p-code engine can execute the programs and it can edit the programs.There is a DATA option that allows you to see the program's data as it is being executed. There is a TRAIL option that allows you to execute the program in small steps. There is an RT, Real Time, option that allows you to change the program as it is executing. There are many YouTube videos that will show you how it works.